Andrew Westmoreland became Samford University’s 18th president on June 1, 2006. As Samford’s president, Westmoreland has led the university to embrace a vision to enrich and expand its service to students, and further inspire their desire to meet the needs of the world. To advance this vision, the university is committed to a challenging strategic plan with three priorities: to provide an enriched and more vibrant university experience; to engage the global community in learning, faith and service; and to inspire imagination. Forever Samford is a six-year, $300 million capital campaign that was launched publicly in fall 2016. It is the largest undertaking of its kind in Samford University’s 177-year history. Funding from the campaign will help to ensure that Samford continues to prepare and send dedicated, thoughtful and ethical people out into the world. Prior to assuming the Samford presidency, Westmoreland was president of Ouachita Baptist University in Arkadelphia, Arkansas. Before his selection as Ouachita’s president in 1998, he had served on the administrative staff for more than 19 years in various capacities. Westmoreland holds undergraduate and graduate degrees in political science and a doctorate in higher education administration. A native of Arkansas, he is married to Dr. Jeanna -Westmoreland. They have one daughter, Riley, who is a graduate of Samford and of Vanderbilt University. His career in higher education spans almost 40 years, including two college presidencies. 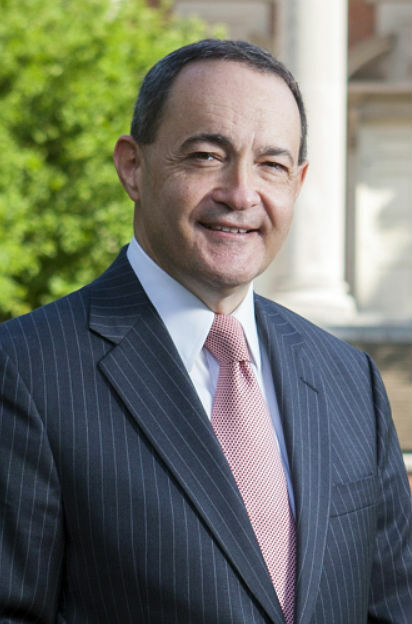 In addition to his duties as Samford president, Westmoreland teaches courses in political science on a regular basis. He serves as a member of many boards for charities and other entities, and he is an author and speaker. He is the past chair of the Board of Trustees for the Southern Association of Colleges and Schools Commission on Colleges, which oversees accreditation for more than 800 colleges and universities from Virginia to Texas. He also served as president of the American Association of Presidents of Independent Colleges and Universities. The Westmorelands enjoy entertaining and annually host more than 9,000 students, employees, alumni, donors and other friends of the university in the president’s home, in addition to the thousands whom they greet and host at on-campus events.